For my new BOM, I'm using all blocks with squares in them. Simple squares are an essential building block of quilting! MCQBOM² started in September 2017 and I've kinda made 1 - 2 blocks per month depending on how I feel, or what's happening in life. Since it's January, a new year, and getting close to the 6 month mark of working on this BOM, I decided it was time to make a plan for what I want to do with it. This block was so fun to make! Not sure where I found it but I love the snowball/bowtie effect! For those who have followed along for a while, you know that when I say plan, I mean loose, vague idea for a plan. That's how my improv quilting works. I know that I want to try to be more diligent about sewing 2 blocks per month going forward. I want to stick with my theme of basic blocks with simple squares and my color scheme of blue, green, yellow, red/purple, grey and neutral. I'd like to try and get my blocks a bit more uniform in size. Right now the first six vary wildly! And lastly I'd like to finish this BOM's blocks around Sept 2018, but continue to work on it and have a finished quilt by the end of the year. As far as plans go, it's pretty vague, but I like it! I'm ready to start working towards these goals! Is anyone else out there starting their own BOM this year? Linking up with Slow Sunday Stitching, Monday Making, Move it Along Monday, BOMs Away and More this week! This block is actually just part of a larger block. When I was making the pieces for the bigger block, I realized that I had never made a bowtie block before! This block was super simple and easy to get together. Also, this is a good block to make for improvers! I can't wait to show the larger block soon! Linking up with Slow Stitching Sunday and Monday Making and more! For this simple, square heavy, Mad Cat Quilts Block Of the Month I took inspirations from Pat Sloan, once again. I like this block bc it's easy to break into little units and piece together. I think this block would be a great one to bring for travel sewing. Below is the photo I used to create this block. Pat Sloan's sew alongs are great, and I highly suggest looking through them for inspiration. I'm linking up around the web today, at Monday Making, Move it Forward Monday, and more. For my new 2017 BOM, I'm using all blocks with squares in them. Simple squares are an essential building block of quilting! I'm not sure how I found the block I'm using for my 3rd block, but it came from Quilt Fabrication. She had a bunch of different variations, but I went with one that had a interlocked feel. This could be a super fun block to repeat in a quilt! I couldn't fine my other blocks when I took the photos, but I can't wait to see what all the blocks look like together! Linking up with Needle and Thread Thursday, Slow Sunday Stitching, BOMS Away, and more! Even before 2017 started, I began thinking of what this year's MadCatQuiltsBOM would be. I had had so much fun working on MCQBOM2016! I chose a theme, had lists and references, but alas, by March I had already given up on the new BOM. It just wan't the right fit. I thought, well, there's always 2018... but I missed making monthly blocks. But then I realized that it was MY BOM, and I could start one any time I liked!! And so I started again, inspired by the last HoneyPotBee block I completed. I found a bunch of blocks that I wanted to make and they all seemed to have squares. MCQBOM² was born. I'm calling that Honey Pot Bee block the first block. This second block, I have no idea where I found it! It came together quickly and I added borders, to make the blog bigger but also to make it match with the first block. As always, I don't follow a pattern, just improve each block. Nothing is measured, everything is cut with scissors, everything is hand sewn. Although I have several blocks on deck, I have no plan for the finished product yet. But if you like either of these blocks, or the direction this BOM is going, feel free to follow along! Linking up with Making Monday, Move It Forward Monday, BOMs Away, and Needle and Thread Thursday. After many months of not wanting to sew any of the Honey Pot Bee Blocks, I like both the September blocks! All the blocks have been interesting and lovely, but not many sparked me. Lots of cat hair, threads and wrinkles on this little block. It will deserve some love before being paired with anything else. This block came together easily and I like that I did end up using a similar color combo to the other HPB blocks I made without even thinking about it! I made this block quite large, which I enjoy, but I can see this being a block to make in a variety of sizes. This block and a few others I've been eyeing lately might inspire me to start a late year MadCatQuiltsBlockOfTheMonth. I failed at my fisrt attempt this year, but what's to stop me starting anew whenever I please? I'm still formulating my plans, but we will see!! Anyone else out there starting a late BOM? Or starting a BOM late? Linking up with Kathy's Slow Sunday Stitching, Monday Making, Move it Forward Monday and more! Finally!! 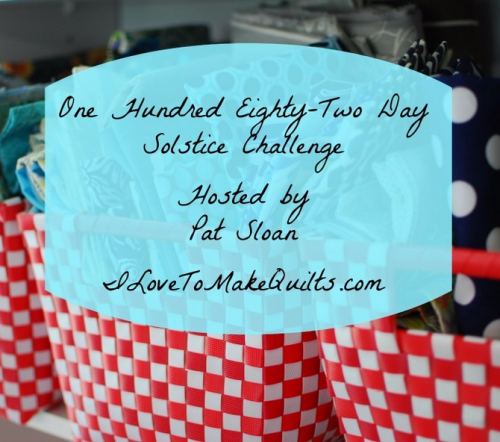 I'm back to making Pat Sloan's Solstice challenge. I couldn't get the corners to stay down for the pic, but besides that, this block was nice and easy. And it feels good to be back on the horse. Linking up with BOMs Away, Monday Making, Move it Forward Monday, and more! This isn't my smoothest appliqué job, but it's the first circle I've ever worked on. I've been working on sewing a lot of orange peels and curves, lately so it was nice to try a different kind of curve. Next time, I hope to hide my threads a little better, but other than that, I like the way this block turned out! Linking up with Needle and Thread Thursday, Finished or Not It's Friday, and more! Here is another block I heavily modified for Pat Sloan's Solstice Challenge. Her Honey Bee block called for appliqué, ut I chose to make some orange peels instead. Her block also called for petals or peels at all four corners, but three were enough for me. I'll need to sweep some threads off this block and square it up, but I'm pretty happy with how it came out! Linking top with Finished or Not It's Friday, Needle and Thread Thursday, Slow Sunday Stitching and more! I'm still trying to catch up on the Solstice Challenge, but I'm getting there one block at a time. Studio Time is another great name for a block. I like that there are a few variations of nine patches in Pat Sloan's BOM. I'm excited to see all the blocks together. Who else is working on this BOM? Are you planning to use the planned layouts? Or are you gonna come up with your own? Starry sky was created by A Persevering Mom and my version came out pretty wonky. I could see this block being really fun for a whole quilt. I like how this block matches with some of the other blocks. After a few blocks I'm starting to get excited about how this quilt will turn out! Linking up with Molli on instagram and Monday Making, Move it Forward Monday, BOMs Away, Oh Scrap! and more! I'm making so many new blocks as part of Pat Sloan's Solstice Challenge! Looking around, there seem to be a few variations of this classic block. This one was pretty easy to make and came together quickly! I cut the pieces for this block at home then pieced it on a bus ride! It came out a wee bit smaller than most of the blocks. I never can tell!! I was pleased to see the name of the 11th block for Pat Sloan's Solstice challenge bc "quilt math" is something I never do. I never use a ruler or other measuring tools when hand sewing and quilting. Quilt math is something I see many quilters get frustrated about, but not me! This was a fun block to make and come together quickly. This is another block I could see repeated to make a fun and geometric full quilt. Linking up around blog land. What are your favorite block link parties? My goodness, you guys! It's the end of march already!! For the third month of the Mad Cat Quilts Block Of the Month 2017, I chose a house block. I have made a hose block before but not a simple straight on one like this. It was very easy to make. But I made it more difficult by cutting a long strip of the bird background that I didn't want to waste. So I ended up piecing it all together a little wonkily. I'm not sure what I used as reference/inspiration for this block but this is a pretty version. April - 5) Four Tree Block - Coming soon! Although not all the months have been revealed there is a vague theme to this year's BOM. Hopefully it's coming together slowly but surely. Originally, my husband was joining me with this BOM but he hasn't had much time to sew lately. If anyone else wants to follow along and share, please do! Linking up with Building Block Tuesday, Main Crush Monday and more! The Coffee Shop Block, block 10 of the Solstice Challenge, is pretty similar to other blocks I've made, but bc of it's boarders, I'm still calling it a new block. It's basically a fat plus block (not sure if there's a real name for that) with little boarders, but playing with color really changes this block's look. Pat Sloan's Coffee Shop Block. Look at how Pat made her version so that the borders become a sort of echo (at right). It's hard to believe how different our two blocks look. I might try that next time. I could picture many variations of this block to make a full quilt. Since I only eyeball the measurements in quilting, this block turned out quite a bit bigger than the others I have made so far. As usually, I'm not worried about it now, I'm sure everything will fit together in the end. I'm linking up with Kathy's Slow Sunday Stitching, Monday Making, Move It Forward Monday, Tuesday Building Blocks and more! For the 9h block of Pat Sloan's Solstice Challenge, she chose a large block, or a small block with many parts, depending on how you look at it. Since I am making all my block around the same size, I didn't want to cut a million teeny HSTs or make an extra large block. Instead, I modified the pattern, using only a fraction of the whole block. I LOVE the way this block came out and I could see doing a whole quilt with just these stretchy stars! I also designed a second fraction of this block that I might also make. I think I will wait to see what the finished quilt might look like first before I do, though. I'm holding on to it in case I need extra blocks depending on how I choose to set them all. Linking up with Building Block Tuesday, Slow Sunday Stitching, Monday Making, Move It Forward Monday, MCM, and more. Every month, Molli Sparkles picks two blocks for the Honey Pot Bee BOM. One is generally a picture block and one more traditional. Some months he even throws in some extra blocks or modifications of previous blocks! I love this idea, because it allows you so many blocks to choose from. Make one each month, or all of them! So far, I've only made the more traditional blocks (another BOM I'm doing uses picture blocks). But I have to say, now that we are three months in, I'm not thrilled with any of them. I know that this falls mostly on me. Because I hand sew all my blocks and tend to favor simplicity (and ease) I have modified both the Feb and Mar Block. That's fine, I like how both of them have turned out. But overall, I'm just not excited or overly inspired by the direction this BOM is taking so far. I'll stick with it. I do like it, I'm just not thrilled by it. Here is my modified Echo Block for March. Sorry I cut off the block a little in this photo: I had to include that cute kitty! I chose this "background" fabric to tie all my blocks together and every time I get ready to sew one I think, why did I do that? It's such s particular brand of ugly. But when each block is done, I'm so pleasantly surprised!! I really like the way it works with all the scraps I've been using. I also really like how light and easy it is to sew. Despite my misgivings, I am interested to see what else is in store for this BOM and wonder what the finished quilt might look like. Are you following along with The Honey Pot Bee? What are your thoughts so far? I'm linking up with Molli via instagram, as well as Needle and Thread Thursday, Building Blocks Tuesday, and more! This was another block from Pat Sloan's Solstice Challenge that called for appliqué. And it's another block where I opted to leave that appliqué out. It's still a new block for me without it and I really like this one! I can very easily see incorporating this block into other quilts. For this and the other block that were supposed to be appliquéd, I used an eye catching fabric for the center of the block. I haven't begun to look at the blocks together to see how the ideas I have might fit into the over all setting of the quilt. But I think having two blocks with these fabric as focal points might work nicely. For the second month of the Mad Cat Quilts Block of the Month, I chose a Spool Block. All the blocks in 2017 will be picture blocks and this struck me as a common block that I have never tried to make. I procrastinated on this block a long time for some reason. It's only February! I should still be stoked for the MCQBOM2017!! But for some reason, I put this one off almost all month. Now that it's done, I'm quite happy with it. It's got some very rough edges but I will fix them up later. Mar - 4) House Block - Coming soon! Although I have a pretty good plan of what other blocks I'll include, I'm keeping future blocks a mystery for now! I also have some plans for layout and what I will want the finished quilt to look like also under wraps. Anyone else out there working on creating their own BOMs? It's a fun exercise! Linking up with MCM over at Cooking Up Quilts and Oh Scrap! over at Quilting is More Fun Than Housework for the first time today! Also linking up with Monday Making, Move it Forward Monday and more! Another New Block from Pat Sloan's Solstice Challenge. I put off making the Crosswalk block for a while, but I ended up enjoying it! That being said, I'm not sure if I would use this block much. I like it in relation with this quilt though, and I can't wait to see the end results.